A 10 yard dumpster is able to hold material up to 10 cubic yards. To break it down that is approximately 4 pick-up truck loads of waste. Uses for a small dumpster rental range from clearing out a one car garage to small updates to the interior of homes. Also offered are 10 yard dumpster heavy boxes which are specific for concrete disposal. A 10 yard heavy box takes up to 10 tons of concrete in one pull, where the regular 10 yard dumpsters only hold 2 tons. A 15 yard dumpster holds up to 15 cubic yards of debris. Used at either residential or commercial jobs metro wide. Fitting up to 6 pickup truck loads a 15 yard container will be your best bet from interior home remodels such as kitchens or bathrooms. This small dumpster rental is good for decluttering the home, garage, and yard in one place. A 20 yard dumpster holds up to 20 cubic yards of garbage. With four foot side walls a 20 yard container is ideal for large residential projects due to ease of disposal. Every dumpster is open top and comes with a large door at the rear. With the ability to walk in the first few loads of trash you will utilize as much space as needed. This midsize dumpster fits on most driveways with room to spare. A 30 yard dumpster is most commonly seen at construction sites for new home builds, though we do deliver to residential homes for remodels as well. At 22 feet long, this dumpster rental will be able to fit on most driveways without hanging over the sidewalk. 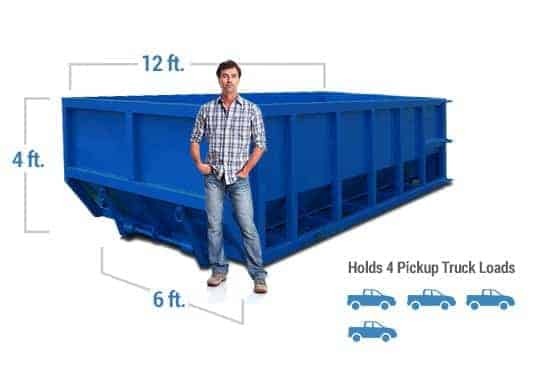 The higher weight limit allows for ample disposal of large amount of waste and bulky items. The largest dumpster offered is a 40-yard container. 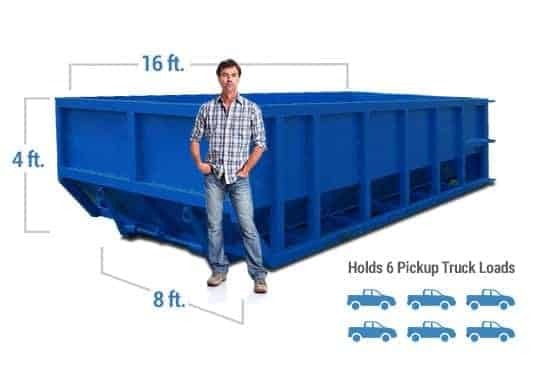 The eight-foot-tall sides make it difficult to dispose of junk on residential properties so you will see this dumpster size at commercial construction sites where the maximum amount of volume is needed for waste management. This is ideal for getting rid of large amounts of debris through renovations or new builds. Discount Dumpster understands that determining which dumpster size for your cleanup project is important. Renting a dumpster which is not large enough will lead to delays and additional charges which can be avoided. All roll-off dumpster sizes are named based on the amount of volume which may be placed in the container. When planning to rent there are multiple factors to consider in addition to size and price. Don’t put your project on hold by choosing a company that is late or charges extra fees. 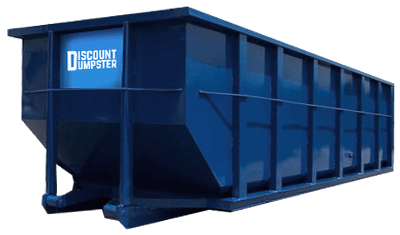 When using Discount Dumpster you are getting top tier industry service from the first call.